Aloe vera is the perfect cleanser as it is easily absorbed, drawing the other beneficial ingredients with it. It soothes your skin and gently cleans away dirt while its anti-bacterial properties protect your skin from irritations. Lime does a lot more than add a refreshing, citrus scent to our cleanser – it also has the ability to help smooth out your skin’s appearance. Availability: Email info@lavishskincare.co.za to find a stockist near you. Although I enjoy natural and organic moisturisers, I don’t often use natural cleansers as my experience has been that they don’t clean my skin as thoroughly as I would like them to. 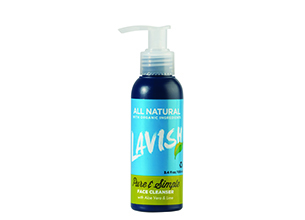 That changed when I tried this cleanser from local beauty brand Lavish. When I first pumped some product out of the bottle I was overwhelmed by the gorgeous fresh, lemony scent – I was expecting something plant-like, and didn’t see the fresh burst of lemon and citrus coming at all. While I was smoothing it on my skin I could really feel it working – my make-up came off easily and my skin felt instantly refreshed. Furthermore, when I looked in the mirror I could actually see that my skin looked fresh and “clean” – it had a healthy glow to it. I love that the product is completely free of nasties and that it contains so much natural goodness. If you’re in the market for a new cleanser and you want to give something natural a try, this might be the one for you!